While Toronto’s development industry is as hot as ever, for the past few years most of that development has been in high-rise condominiums, so much so that some experts worry the condominium market is oversaturating. However, demand for rental apartments has risen rapidly. Toronto’s vacancy rate is very low and average rents are extremely high. The unregulated rentals of individual condominium units have been the primary source of new rental supply, so the time is ripe for dedicated rental developments. Condominium developers have been slow to make the switch. 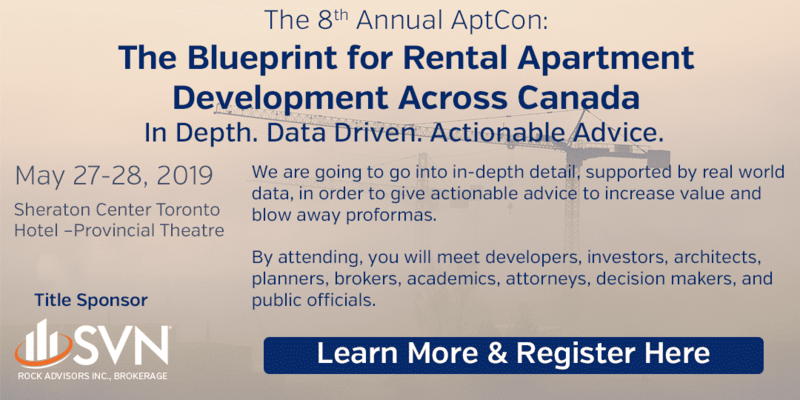 Toronto’s eighth annual AptCon conference on May 27-28, 2019 is being hosted by SVN Rock Advisors Inc., Brokerage. It will take place in the Provincial Ballroom of the Sheraton Hotel in downtown Toronto There will be a deal room where potential apartment developers can sit down one-on-one with members of the SVN Rock team to discuss possible projects in depth.